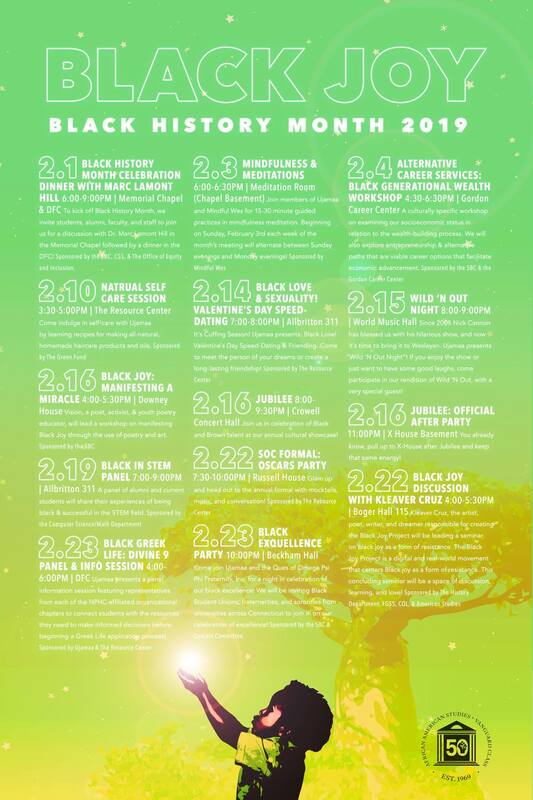 This February, Ujamaa, the University’s Black Student Union, is commemorating Black History Month with a series of events centered around the guiding theme of “Black Joy.” In conjunction with this theme, events over the course of the month will range from a meditation and mindfulness session to panel discussions on the Black experience within different University realms. The Ujamaa board includes, among others, members Inayah Bashir ’20, Samia Dudley ’20, Chelsea Dixon ’22, and Alice Swan ’21. In an interview with The Argus, Swan reflected upon the meaning of “Black Joy” and its significance to the celebration of Black History Month. During and beyond Black History Month, Ujamaa hopes to continue the discussion and consideration of how to carry “Black Joy” throughout their activism efforts. For Bashir, embracing “Black Joy” in social advocacy is a powerful form of resistance. The month-long celebration will consist of events ranging from cultural performance showcases, to alumni and student panels, to a discussion of “Black Joy” with Kleaver Cruz. According to the Ujamaa board members, the planning process involving arranging campus speakers and sorting out logistical details for the 14 Black History Month events began early fall semester. In organizing events for Black History Month, Ujamaa has also worked closely with the African American Studies Department, which was recently granted department status via a full-faculty vote on Dec. 4, 2018. In the future, the Ujamaa board hopes to engage more individuals by creating a planning committee to coordinate events over the course of the month. Ujamaa board members also spoke about the ongoing dynamics of social activism, as well as how Ujamaa intends to approach cultivating meaningful relationships and a sense of community during Black History Month and beyond. On Friday, Feb. 1, Dr. Marc Lamont Hill, one of the leading intellectual voices in the country, came to speak on campus, marking the formal commencement of Black History Month. The Ujamaa board members expressed that Hill’s words about celebrating unity resonated with them in thinking about the various identity group dynamics on campus. The Ujamaa board hopes to see a great turnout from different communities across campus to their events during Black History Month and beyond. Serena Chow can be reached at sschow@wesleyan.edu.